[Update: February 6, 2012]: This home sold on February 3, 2012 for $1,550,000 which was $51,000 more than the listed price at $1,499,000 in approximately 2 months time. Hot off the presses from the always informative Lauren Beale of the L.A. Times Hot Property comes word of a former Cuba Gooding, Jr Home in the Studio City area which is now owned by Roger Neill is now available for sale starting at $1.499 million. Cuba Gooding Jr is an Academy Award winning actor for his portrayl of Rod Tidwell in the 1996 film, Jerry Maguire. He has also performed in various films like Boyz n the Hood, A Few Good Men, Lightning Jack, and a variety of other films with his career in acting going all the way back to 1981. Gooding, Jr is a native of the San Fernando Valley who attended North Hollywood High School and John F. Kennedy High School although he was born in New York City. I am not sure where he actually lived but according to Wikipedia, he lived in various hotels throughout Los Angeles after his father left the family. Roger Neill is an arranger, orchestrator, conductor, and collaborator who has worked with variety of artists and projects. He is mostly known for his 13 seasons scoring the Fox prime-time animated series King of the Hill. One of the best buys in the Studio City Hills. The "former Cuba Gooding compound". A classic 1955 Mid-Century Modern Ranch House in the style of Cliff May. 4 Bedrooms including 3 Bedroom Suites plus 5 Baths. Formal Entry with Powder Room, Master Suite with Fireplace & French Doors opening onto Pool & Decks. Large Formal Dining Room. Huge Chef's Gourmet Center Island Kitchen. Living Room with Fireplace and Walls of Glass. Family Room-Screening Room-Recording Studio. Immense Park-Like Grounds, Pool, Custom Decking, Private Terraces, Panoramic San Fernando Valley Views. The property affords Total Privacy & Seclusion. Feels like Brentwood or Mandeville Canyon. Minutes from Beverly Hills and the Westside via Coldwater Canyon Avenue. Close to the Tree People Compound, Harvard-Westlake School and the Shops & Restaurants along Ventura Boulevard. Close to All Valley Studios and some of Los Angeles Finest Private Schools. A Wonderful and Unique Property with Large Flat Land. Cuba Gooding, Jr originally purchased this home in 1994 for the measly sum of $305,000 which makes me wonder if this home was in really bad shape when purchased. However, there was a time when homes were relatively cheap and affordable and being that the architecture of this home is a Mid Century Modern style may have depressed its value back then when MCM's were not as popular as they are today. Gooding, Jr sold this property on December 30, 2009 for $1,375,000 to Roger Neill netting Gooding, Jr approximately a 4.5x gain not including expenses which is quite the profit in 15 years. Imagine how much he would have earned if sold at the peak. Gooding, Jr has kept his roots in the San Fernando Valley and continues to own a home in Porter Ranch that was purchased on February 10, 1999 for $439,000 as well as a Pacific Palisaides home that was purchased on May 31, 2000 for $3.5 million. All three of the homes including the Studio City home were purchased under a trust. 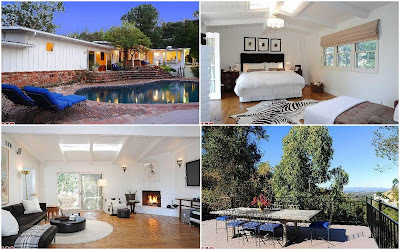 You can find more San Fernando Valley Celebrity Real Estate here. No Comment to " Celebrity Real Estate: Former Cuba Gooding Jr Home in Studio City Now Owned by Composer-Arranger Roger Neill Lists for $1.499 Million "